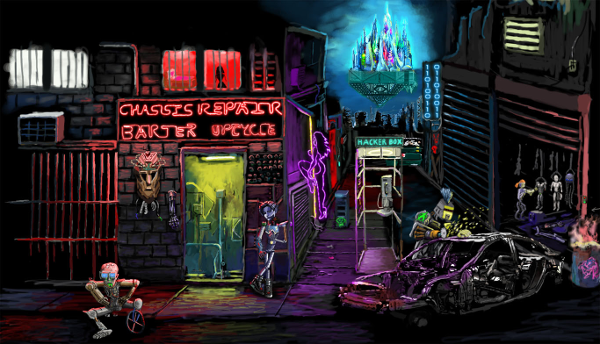 Erik Meyer: The art style blends with the game’s music and dialogue to create a gritty, organic feel. Describe the overall goals and criteria you maintain for game assets and the need to have everything mesh within the game experience. What makes everything ‘feel right’ to you? Christian Miller: I’m glad that the art, music, and dialog came off that way for you. I like to joke that being a creative fiction writer is basically a ‘public display of delusional schizophrenia’ — in that you’re basically lying for hundreds of pages and taking on multiple personalities (characters) all day long, then people read your craziness. But being a one-person indie game developer, flipping between being writer, programmer, artist, director, business-suit, etc… is like being a writer, but ten times worse! Seriously though, some specific goals for Neofeud were: 1.) A unique and stylized visual approach to dark sci-fi / cyberpunk 2.) a compelling, original story, and 3.) characters you love, or hate, and you can’t wait to see/hear more about on your next play session. I wanted any particular scene in Neofeud to be instantly recognizable to someone as, “Oh, that is DEFINITELY from that game, Neofeud,” rather than, “That could be sci-fi game X, or action movie Y, or neon-drenched cyberpunk graphic novel Z…” I’m a huge fan of Ridley Scott, and Neofeud obviously has some of Blade Runner’s ‘DNA’ in it. But at the same time, I think it’s Scott’s cinematic virtuosity, his pioneering of this wholy new visual style — along with nailing the ‘compelling story’ and ‘amazing characters’ angles — that made Blade Runner stand the test of time as a truly great film, in my opinion. One more note on making everything mesh together- I did initially want to save some time and have the music done by someone else, and my good friend Scott Smigiel offered to compose a bunch of tracks for the game. He did a great job, really, and I really liked his heavy industrial / noise music vibe, but ultimately, when I started putting the music into the games, something wasn’t quite much of the time. (This was mostly my fault as I didn’t give Scott very good direction on the music, and did a lot of modification to the world on the fly). As you say, ‘it just didn’t quite feel right’. So I ended up composing 43 of the 45 tracks for the game myself, one scene at a time, while really taking care to nail the mood, atmosphere, and emotion of the scenes. EM: I’m interested in how you see your role as a STEM teacher in Honolulu working with underserved youth impacting the dystopian cyberpunk adventure you’re creating; how much does it drive you? On your Patreon page, you speak for a need for kids to have opportunities for a better future, much as the world of Neofeud feels at the same time fascinating, dehumanizing, and bleak. Do you feel games need to answer to lofty goals and act as social critique, rather than simply serving as entertainment? Within indie game experiences, what kinds of opportunities push us forward? CM: Let me just say, first off, that I don’t want to tell game makers, indie or otherwise, how and why to make their games. But personally, my games are absolutely influenced by my own life experiences, and I believe that there are opportunities, certainly in narrative-heavy games, to impact culture and society, to varying degrees. Hawaii is known for its postcard-paradise, but let me tell you, it is not all fun and sun for everyone who actually lives here. I grew up a native Hawaiian in what is essentially Hawaii’s equivalent of the ghetto. Most of the folks in my neighborhood were non-white, and many were immigrants. My neighborhood friends lived 10+ to a house, and ate pork and beans and rice on a regular basis. My jobs over the years have involved working with kids who come from really horrible circumstances, many with parents incarcerated or out of their minds on drugs, many homeless, living in vans, some even getting beaten in the street for sleeping on the sidewalk. I remember asking kids to bring back really simple things like permission papers, and some kids would tell me, “Mr. Chris, I don’t see my parents, they work all day.” So there were kids who had working parents with two or more jobs, and were still homeless. And me as a teacher in Honolulu with a wife and two kids? We were basically one step away from homelessness. In my opinion, cyberpunk dystopia is already here. It’s just human society is very good at papering over the more dystopic parts. 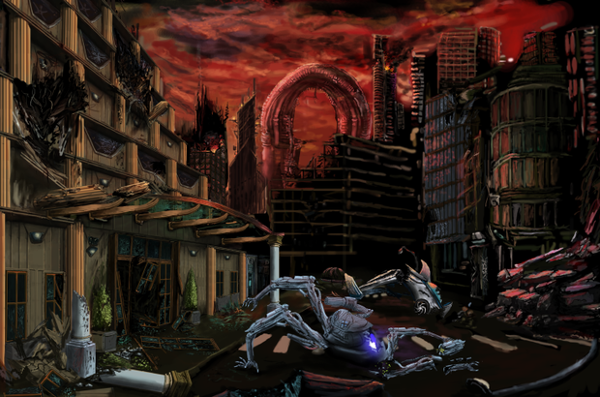 The world of Neofeud, where you have the equivalent of the Palace of Versailles literally floating above an endless cross between an L.A. slum, a Mexican shantyscape and a mega-landfill, is sort of taking my own experiences and cranking the knobs up to 11. It’s a world where the marginalized (robots and chimera part-humans) have to pass a ‘consciousness test’ to even be *considered* a person, and are easily discarded, disappeared, used for borderline slave-labor or to prop up a prison-industrial complex. These characters and events are all based on my own experiences, and are much less ‘fictional’ than one might expect. Neofeud, I hope, doesn’t merely entertain, but also makes one think at least a little about the world we’re in, and where we may be heading. Neuromancer, the seminal cyberpunk work by William Gibson was fundamentally a cautionary reaction to the economic downturn, the ‘greed is good’ mentality, the rising inequality and general bleakness in the early 80’s. The best science fiction says something fundamental about the present, in my opinion. At the same time, everyone has their own experiences, and their own things to say and express, in their own unique way. I think at least indie game makers can aspire to this. I’d prefer to live in a world where games aren’t all just the next ‘hot’ cash-cow of a genre, anyway! EM: High technology in the game exists alongside tent cities, stagnating bureaucracy, and failing infrastructure, so as a developer, what is essential in using these stark contrasts effectively? CM: I wanted to really emphasize the extreme societal stratification — the ‘upper echelons’ of society literally live in the ‘Stratoplex’, which is could be interpreted as literally living up in the stratosphere, as the cities float up in the clouds, as well as an extreme upper class. And yes, this contrast needed to be reflected in the visual appearance — you have opulent gold, tropical blue, and lush manicured green lawns up there, and below you have a heavy urban decay and people living in literal junk piles, with patchworks of brown, black and grey, and multicolored ‘vomit’. If you’re last-year’s model of android servant, you get tossed out of the sky castle and don’t automatically get the cyber-prosthetic refurb when your ‘iArm Version 7’ breaks. So you plasma torch a piece of a totaled motorcycle, screw and ductape some bits of a toaster on it, and there’s your replacement. Everything is broken, archaic, and patched-together. It’s not ‘nice’. Having lived in an actual below-the-poverty-line slum, I can say this is one of the things missing from cyberpunk nowadays. To me, it feels everything is too clean and polished. I wanted Neofeud to capture that actual grit and dirtiness that I think is often missing. 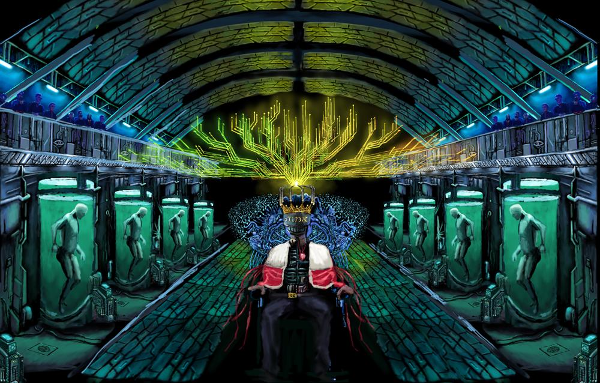 EM: Neofeud has a wide variety of sentient life, from androids and cyborgs to failed eugenics experiments that get dumped without rights into a violent world. Can you speak to this interest in personhood and how your project gives us a safe space in which to view these kinds of concepts? What do you see cutting to the core of second and third-class citizens? Where a lot of intelligent robots in popular culture focus on the ‘Skynet’ scenario where machines take over and kill or enslave the human race, or the ‘Singularity’ where exponential leaps in technology push toward superintelligent AI that solves all of our problems with its infinite wisdom, I wanted to turn all these tropes on their head. I looked at my own experiences, as well as at history, at how human beings *actually* have dealt with other human beings who were different from them. And the situation a lot of the time is, “Not very nicely”. Blacks became slaves in America. Native Americans were decimated and herded onto reservations. Immigrants are generally marginalized (I worked with these folks, as I mentioned). So what if huge corporations were to reach the point of producing conscious machines? Thomas Edison famously had “999” non-lightbulbs, failed prototypes on the way to making the successful product. What if there were thousands, millions of ‘failed’ prototypes of conscious robots on the way to producing the one ‘success’? What if these sentient machines were actually on-par, or ‘more conscious’ than humans, and began asking for ‘sentient rights’, fair pay, the ability to own property, etc? How would we determine who gets to be a robot ‘pet, livestock, slave’ and who gets to be a robot person? What if humans decided to rig the test to maximize their own wealth, increase their own ‘dynasties’ at the expense of tossing a lot of these sentient machines into landfills? In short, maybe humans would treat those not merely of a different skin color or culture, but of an entirely different substrate, any better than the ‘others’ who’ve suffered throughout history. Add to that our current trajectory of skyrocketing inequality and concentration of wealth (five men now own as much wealth as half of the human race). EM: You have a Patreon to help fund your project and get the word out about it, so let’s speak to crowdfunding for a moment. What kinds of social media connections have helped you through your process, and what kinds of feedback have you gotten from your supporters? What have you seen as the biggest hurdles, from a marketing point of view? CM: I had considered doing a Kickstarter initially, but the general advice I was getting was, “Running a Kickstarter is a full-time job.” And since I was basically full-time-and-a-half working on Neofeud while also working a day job, juggling a Kickstarter on top of that sounded like a recipe for catastrophe! So I had seen at least one other game developer, who was actually based in Hawaii (EYUH Games – making Gaimoria) who was getting some pretty good monthly funding for their project through Patreon, and I decided to try that. My long-time Patreon supporters Deborah Dunaway, Scott Smigiel, Belinda Taylor, and Ian Ruotsala have been a huge financial and moral support, so I’d like to thank them. Social media-wise, I’ve found one of my biggest hurdles was going out there and meeting people, overcoming one’s shyness and ego, and asking for help. A couple folks in particular, Mark J. Lovegrove of screen7.co.uk and Frank Meijer (@_kaassouffle) have helped me in massive ways on the business and marketing side of game development. I was basically a complete bumbling idiot business and press-wise during Neofeud’s initial release on Itch.io, which had minuscule visibility, whereas I’m feeling much more confident with the responses and coverage of Neofeud’s Steam release thus far. And largely this is thanks to veterans like these guys who’ve been in the industry and really know their stuff. So yes, ‘getting over ones-self’ can be a huge hurdle. 🙂 A lot of success in the game industry, and any creative industry is of course luck, but a lot is really just being a good person and talking to people. It’s tough for introverts like me but ya gotta do it! EM: Point and click adventure games have been around for decades, so while the Neofeud universe has its own constraints and plot arc, what functional, technical goals have you held for the flow and operations of the game? What are must do things for point and click projects, menus systems, and puzzles? CM: Hm, personally, one of my big mantras was, “Don’t make puzzles for puzzles sake.” Point-and-clicks tend to catch a flack, and sometimes fairly, for having lots of obtuse or kind of ridiculous puzzles that take ages to solve. I didn’t want the narrative to be disrupted by the player getting stuck for a very long time, or by doing something really weird or out of character for the sake of having a puzzle (the famous example is the cat mustache puzzle from Gabriel Knight 4!). 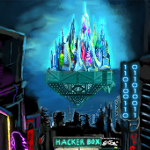 The challenges in Neofeud often involve social puzzles, where you need to speak to characters, or have the right character in your party handle a certain situation, which fits the world and situations of the characters. For example, at one point you have a half-robot ex-cop, a robot gangbanger, and legitimate “Neofeudal Royalty” in your party. The ex-cop is good at doing detective work and interrogating, the robot gangbanger has a more “violent” way of dealing with things, and the royalty can essentially use their ‘political power’ to order suits, agents, even corporate executives to do what she wants or face the wrath of her world-dominating ‘Corporate State’. But the catch? She can’t really pick locks, or be seen in certain situations, for reasons that might compromise her agenda. Other than this, the interface is pretty standard point-and-click, with ‘look’, ‘talk’, ‘walk’, ‘interact’ cursor modes. I tried to make it intuitive enough for old-hats and newcomers to the genre, alike! EM: As a one-person studio, give me a view of your process and work flow; what kinds of things are easier, due to your singular nature, and where do you see most of your time going? When adding new game elements, what is the process like from genesis to polished implementation? CM: Generally speaking, I started Neofeud by throwing a lot of brainstorming project ideas, short stories, character ideas and worldbuilding stuff into a really big Word document. Over time, I had a bunch of different game concepts, and Neofeud actually began as a Unity platformer, with a cyborg cop shooting mutant roaches, like Fallout crossed with Megaman, believe it or not. That was later scrapped and I moved on to the point-n-click idea as it suited what I wanted to do with the narrative better. I essentially got a good chunk of the story outlines, and began painting assets, implementing in the game, adding logic, mostly at approximately the same time. I’ve found it was a bad idea to do too much work in one area like make a ton of sprites, and then discover the format or size or something isn’t working right in the game, then have to do it all over again. Better to have small iterative cycles. To be completely honest, my process is somewhat chaotic, but I believe that some of the particular ‘lived in’ and organic feel of Neofeud has to do with my own game dev process. Where the obvious drawback of a one-person development team is the multiplied workload and need to acquire a wider array of skills, one of the luxuries is the ability to essentially make any changes, anywhere in the game, on the fly, as inspiration hits. So for example, I might have written out a story script for a particular scene, and now I’ve begun painting the background for it. Then, halfway through painting the background, I make a mistake, like a skyscraper in the background was placed too high to make sense. But then I ask, “What if these buildings are not on the ground, but actually levitating above it?” and from there I can simply run with the idea, working the story and programming around that concept. Now, if I was on a team, I’d have to go through the story department and the art department and the programmers and it’d take longer, as well as probably cause some confusion and friction. At the same time, I can see the huge benefit that spreading the workload around can bring, as the games can be completed faster, and without having to spread yourself out quite as thin. I’ve looked into potentially working with other writers, including a group called Chaos Nova to try to do just that. Last but not least was the music and voice acting. As mentioned, I did compose the music myself, and that took a while, probably two months to really nail everything exactly right. The voice acting is the one part I got help with. I did about half of the voice acting myself word-count wise (two of the main characters). All the main characters and most of the smaller roles were performed by actors who had experience in drama or had theater training. And perhaps more importantly, I wanted people who really truly understood the script, what Neofeud was really about, and could bring these unusual characters to life. EM: What does having the game on Steam mean to you as a goal/benchmark? What kinds of support do you anticipate to be providing, and do you anticipate adding more content beyond the September release? Additionally, do you see expectations and opportunities regarding indie games changing? How is the industry evolving? CM: As mentioned previously, I was not so bright in the marketing/business department, and didn’t get Neofeud to Steam Greenlight till it was almost out (bad move!). Finally getting Neofeud to Steam is a big deal, I think because the game is made for PC, and Steam is basically *the* PC platform, certainly that’s what I’ve gathered, however late-in-the-game. I’m pretty broke at the moment, but I’m pretty hopeful for the Steam release, as I’m already seeing many times the numbers of folks who bought Neofeud on Itch.io adding Neofeud to their Steam wishlist, two weeks before release!